San Francisco — Several hundred people gathered here on Oct. 9 at the Civic Center Plaza to demand “No Muslim ban ever!” The rally was held on the eve of the originally scheduled U.S. Supreme Court hearing on Trump’s Muslim ban. After #45 changed the travel ban a few weeks ago to include north Korea, Venezuela and Chad, while removing Sudan from the list, the Supreme Court removed oral arguments from the calendar, requesting additional briefings from the parties. The initiators of the rally, Asian Americans Advancing Justice-Asian Law Caucus, the Arab Resource & Organizing Center, the Black Alliance for Just Immigration, the Council on American-Islamic Relations and the National Iranian-American Council, held that “the addition of non-Muslim majority countries to the ban, namely north Korea and Venezuela, does not negate its inherent anti-Muslim intent.” There were at least 30 other organizations who joined in as sponsors of the rally. 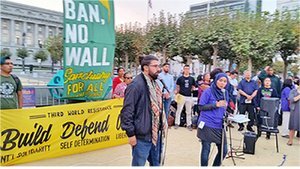 Emceed by Shareef Ali from AROC, the rally included dozens of speakers from impacted communities, including representatives from Hella Organized Bay Area Koreans, GABRIELA USA and the Islamic Cultural Center, as well as a Venezuelan community activist.